Stock photo of the skyline of Toronto illuminated at dusk with high rise buildings and CN Tower. Skyline of Toronto in Ontario, Canada at dusk. Skyline of Toronto City seen from Ontario Place, Toronto, Ontario, Canada at dusk. 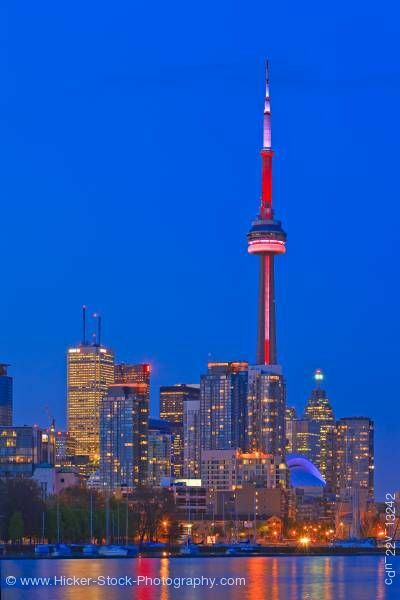 This vertical picture of the Toronto skyline shows beautiful reflections in the water, with the illuminated city, high rises and the CN Tower rising above. This vertical stock picture of Toronto offers lot of copy space and has enough space for a large headline.